Like many others, I am a big fan of live upgrade when it comes to upgrading/patching solaris. This post is for the system admins who still wants to use the traditional method of patching for whatever reason they want to. The example system we will be using has SVM based mirrored root. 1. Check the health of all metadatabase replicas (metadbs) and SVM metadevices. 2. Check the current boot device. 3. Confirm the boot disk and mirror disk from the format output. As seen above, here the root disk is c1t0d0 and the mirror rootdisk is c1t1d0. 4. Backup important command outputs. 5. Install the bootblock in the root mirror disk c1t1d0, to make sure it is bootable. 6. Detach and delete the SVM mirrors. 7. Clear the metadatabase replicas from the root mirror disk. 8. Mount the mirror root disk and replace the SVM related entries in the /etc/vfstab and /etc/system to prevent SVM to start on boot from the root mirror disk. Remove the entries related to SVM from the /etc/system file. 9. Confirm if the server boots from the un-encapsulated SVM root mirror disk. 1. Boot the server into single user mode. 2. Unzip the patchset bundle and look for the passcode. 3. Install the patch cluster. 4. Check for any errors or warnings during the installation. In no error found reboot the server in multi-user mode. Once we successfully install the patchset bundle and are sure to go ahead with it, we can re-mirror the root disk with the mirror. 1. Create the metadatabase replicas on the root mirror disk. 2. re-create and attach the root and swap mirrors. In case the patching gave you an error or if there is some issue with applications not working properly after patching, you can always roll back the patching and boot from the old patch level. The way to do this is, we re-encapsulate the un-encapsulated rootmirror disk under SVM and mirror it with the original root disk. This should look the figure below, once it is completed. 1. Boot from the un-encapsulated SVM root mirror disk. 2. Copy the partition table from rootmirror disk to root disk. 3. 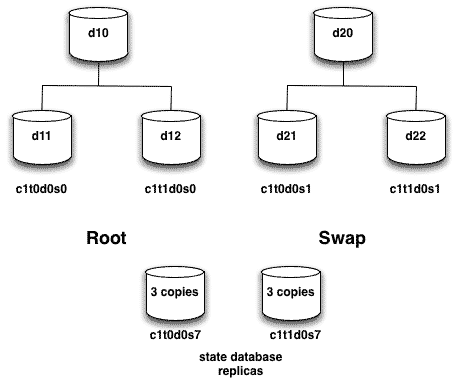 Create the state database replicas(metadbs). 4. Create the sub-mirror metadevices. 5. Create the mirror d10 for root. 6. Add the below entry in the /etc/system file which allows the system to boot with less than or equal to half the total metadbs. 8. Attach the sub-mirror d12 to mirror d10 to sync the data. 9. Re-create swap under root partition. Change the /etc/vfstab entry for the new swap. Add the swap again and set as dump device. # eeprom "nvramrc=devalias rootmirror /devices/pci@0,0/pci15ad,1976@10/sd@0,0:a rootdisk /devices/pci@0,0/pci15ad,1976@10/sd@1,0:a"
11. Install the bootblock on the new mirror disk.